With all the BagTrends Arm Candy Party craziness, I haven't even shared any fashion week scoop, bag sightings or "in the swag bag" reviews. To be honest, I didn't go to too many shows this season (thank goodness for style.com and great press contacts that will let me check out bags up close over the coming weeks) because it was all arm candy party focus!! I did, however, attend a few shows, several fun events, and bag previews including Anya Hindmarch and Elaine Turner (more on that later). The week kicked off quite nicely with a Glam.com event at the Library Hotel. I could only stay for about 20 minutes before rushing back to the tents to speak to guests at the AMEX Skybox ab out hot handbag trends - which was really cool. I ended up coming right back to the Glam event to catch up with Lauren from SecondCityStyle, Miss Meghan, and by bff Zandile from TheBlayReport. To maximize time I was thrilled Glam set up a mini salon; so I got a desperately needed pedicure. A pedi, good friends, great food... what else can a girl ask for? A gift bag? Normally, I don't care for them because it's usually 50% useless 30% gift certificates I will never use and 20% really heavy haircare products or candles!! Glam's bag had a flirty, black, cotton tank top from Express. 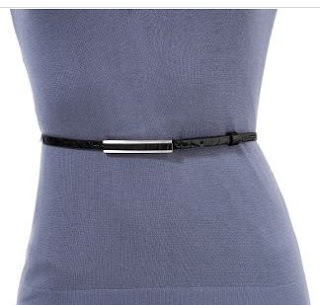 I enjoy a tighter fit so I plan to use the $50 Express gift card that was also in the gift bag to ge a belt. A Skinny Croco Belt ($24.50) is right on trend for the season. With the leftover money I think I'll get this Jackson Pollack inspired A-line skirt. OMG, what a party we had on Monday. The BagTrends Arm Candy Party was a big hit with plenty of bag-a-licious shopping, signature Bagista Martinis, and spa pampering. Guests enjoyed a luxurious, shopping oasis where they perused the hottest, contemporary handbag lines. The evening featured fall collections from Ananas, Antoinette Lee, Creations by Kage, Elezar, Filippa Sweet of Stockholm, Helena de Natalio, Ignes Handbags, m. Clifford Designs, Magnes Sisters, Passchal, Rebecca Minkoff, and Vegan Queen. For those interesting in borrowing bags, AVELLE, the new bag borrow or steal, was on hand to showcase their expanding assortment of accessories including vintage Hermes, Judith Leiber, fine jewelry, sunglasses and more. Guests were even treated to a $50 gift certificate to http://www.avelle.com/. But no BagTrends Arm Candy Party would be complete without some yummy baubles! Ted Rossi showcased exquisite bangles, headbands, and rings. 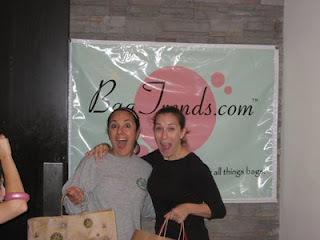 Even the BagTrends girls could not help getting in on the bedazzling shopping. After all that exhausting retail therapy, our bag-a-licious divas headed into the “Spa Room” where they were treated to complimentary massages courtesy of the fabulous team from Massages for Health and Fitness. Massage therapists eased away stresses using Booty Parlor’s decadent crèmes and oils. Booty Parlor booticians were also on hand to pre sent their full line of flirty beauty and body products. Booticians also chatted up brides-to-be and their friends about unique Booty Parlor bachelorette parties. We’re already planning our next BagTrends Arm Candy Party, so if you want to join us for a party that is part shopping, part spa, 100% bag-a-licious fun email info(at)bagtrends.com with "next BagTrends Arm Candy" in the sunject line, and you’ll be the first to hear about the date and location. For a full review on the event CLICK HERE. Only 3 days left until our big, bag-a-licious BagTrends Arm Candy Party. I just got word that one of our designers, m.clifford design, will do a raffle where you can win their Meghann satchel in navy. I have seen this bag in person - and actually used it for a photoshoot in Success for Women Magazine (more on that next month) - and I'm in love. The spacious dimensions on Meghann make it a great weekender bag, ideal as a carry-on, and suitable for work if you need to carry a lot of stuff. You'll love the lux red suade lining - an m.clifford signature - and a surprising feature given that the bag ret ails under $500. I'm not saying that's cheap, but MOST bags that do have the suede lining, the custom hardware and the craftsmanship you see in Meghann retail for much more. And, did I mention pockets? Meghann has pockets galore!! At the BagTrends Arm Candy Party, the designer behind m.clifford handbags, Martha Clifford, will be on hand to present her full line to the lucky bagistas in attendance. Aside from Meghann, I have my eye on the Terrell tote - as seen on What Not To Wear. I'm always on the hunt for the perfect non-laptop, laptop bag and Terrell, with it's wide opening (thank you! the zipper doesn't just go side-to-side, but over both edges of the bag) and long and wide shape, is just right. We’re just days away from the official PUBLIC!!! 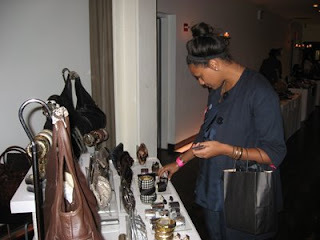 – yup that’s all of you – launch of the BagTrends Arm Candy Party. The whole BagTrends team has been working up a sweat making sure this shopping party is perfect, chic and VIP all-the-way. We want you bagista divas to shop the best handbag lines, be pampered with massages and enjoy yummy Bagista Martinis!! Tickets are $10 for 2 – so bring the bff. If you’re a fan of Rebecca Minkoff, you’ll flip for her fall/ holiday 2008 collection and love the discounts on her spring/summer 2008 line. What kind of VIP deals will you get? A one-a-kind sample? A hard-to-find Morning After color? You’ll have to come to the BagTrends Arm Candy Party to find out!! And here’s a newbie that I know you’ll all really love. At the BagTrends Arm Candy Party you can shop Ignes Handbags and meet part of the brother-sister team behind the brand. In addition to selling their meticulously crafted bags, Ignes will also be taking orders on custom handbags! To learn more about Ignes, check out an interview I did with designer Maria Estrada. Fabulous massage therapists from Massages for Health and Healing will be "on hand" in our spa room, pampering guests with hand/kneck/shoulder massages. They will be using yummy new lotions and oils from Booty Parlor. Booty Parlor will also be in our spa room promoting and selling their new beauty/body products! Can't wait to see you at BagTrends Arm Candy Party! The weekend just flew by. Friday I did my thing at the AMEX Skybox, which was great. I love sharing my bag-a-licious scoop with an eager and attentive crowd. It was sort of like being on HSN only with a very intimate group of about 30 women (and a few guys) and the freedom to really speak about any price point, any brand, and really anything I wanted. The women asked about current trends, what to expect for spring, is hardware going to be big, are exotics still in and what do I think about big bags. My abridged answers: fall is about berry colors and structured bags in medium sizes; spring will continue to see a strong push for long structured totes and plenty of day-night clutches; hardware will slowly creep back into vogue especially in the form of exposed zippers; exotic skins are always hot, hot, hot; big bags are a big pain - save your backs. (just as soon as my FLIP video is fixed, I'll show you the inside of the AMEX Skybox). While at the AMEX Skybox, I caught the Rubin Singer, Perry Ellis, tail end of BCBG and the Erin Fetherson show. I'm not a fan of Erin's clothing - a bit too girly and flowy for me. This season was a bit more grown up, but still with a bubble gum color palette. The soft, billowing layers featured on a few dresses also reminded me of a cross between cotton candy and a really cheesy wedding dress. That being said, many of the women in the room did like her work, so it's just a matter of what you prefer. I'm more into architectural pieces and saturated colors. Yesterday I reluctantly heading back to the tents - it was such a beautiful day and I wanted to go swimming. But, I had a date with Tracy Reese and nothing can hold me back when it comes to her. I met up with Karen, who does video for MyItThings.com and we headed backstage to get the scoop on Tracy's Spring/Summer 2009 collection. I interviewed makeup artist, Mally - who's the sweetest and always makes time to chat with me. For the full interview, checkout http://insidethetents.com/. After the show, I also caught up with Tracy - that interview should be up soon. I'm not going to any shows today, too much work in the office! Mercedes-Benz New York Fashion Week SS09 just started and already I've brush elbows with Anna Wintoutr on her way into the BCBGmaxazria show. I struck up a lovely conversation with one of my favorite fashion personalities Robert Verdi and I'm making nice with the sweet pr gals over at the Office Max booth. The booth, new to the tents, is a refreshing white space with plenty of pens, paper, yummy cupcakes in the shape of notebooks and laptops. I imagine Ill be spending a lot of time in this area given that the people are pleasant and the space is useful. This is one advertiser I'm really liking - I'm not liking the Mercedes-Benz cars that yet again are occupying space that should be seating and accessory presentations. They are beautiful, but can we get them outsid or maybe just do one car? PS In one hour I head to the AMEX Skybox to chat up the Perry Ellis show. I promise to take pictures. American Express Skybox: American Express unveils a newly enhanced Skybox this season that provides premium access for American Express Gold Cardmembers, Platinum(R) Cardmembers and Centurion(R) members to experience the runway shows in a truly unique way. Overlooking both the Tent and Promenade but undetectable from the runway, the Skybox features a VIP lounge-style viewing room where Cardmembers can mix and mingle over great refreshments and premium beverages, and converse with influencers from the world of fashion. This season’s Skybox will be designed by American Express Cardmember Frank Carfaro, acclaimed founder and creative director of contemporary home furnishings company, DESIRON. Guests expected to attend include Phillip Lim, Philip Crangi, Joe Zee, Tory Burch, Linda Fargo, Julie Gilhart, Pamela Pekerman, Diane Von Furstenberg and Richard Chai, making the Skybox an experience not to be missed. Yup, that’s yours truly right next to DVF. I’m delighted to be chosen along with great designers, trend spotters, and editors. We’ll be on hand to chat-up trends and scoop with Cardmembers as they get the VIP treatments. If you happen to be one of the lucky gals or guys, I look forward to meeting you. For everyone else, I finally found my FLIP Video so I’ll document the whole experience! !